To renew your listing you will need to be logged into your Classifieds account. 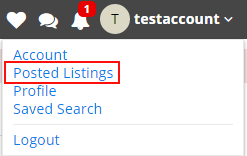 Once you are logged in you will click on your username and click on Posted Listings. Once you are in your Current Listings, you will see all of your current running listings, those that have either sold or have expired. You can either select a certain listing with the check box, and then select Renew Now. The other option is that you can select the Renew Now option on the right side under the section Renew In. You will see a green bar at the top of the page stating if the listing was renewed. If it was successfully renewed you will see "Your listing has been renewed." The listing will now appear on the Classifieds for another 7 days.